Here's a photo you don't see every day, showing the highly efficient Chinese killing machine. I won't show you the next photo, of the woman lying on the ground, everything above her nose blown to oblivion. Look at the woman. Do you suppose she's a mass murderer? A terrorist? I don't know, but my bet is that she's a peasant woman who tried to make a buck and might have gotten six months imprisonment here in the U.S. Or she's someone who spoke in public about a corrupt official, an act that would have earned her accolades here in the U.S. It's abominable, right? So now look at the bottom of the coffee cup that's by you as you read this. Does it say "Made in China?" Mine does. Check the label on your clothes. Are they made in China? Plenty of mine are. As are my toaster, tea pot and my computer's power cord. Did the money we spent on these products buy the bullet in the chamber of the soldier's rifle? Yes; it's undeniable. You support the coffers of that government whenever you purchase anything with the “Made in China” label. You support these executions – whether they are legitimate or otherwise – whenever you demand the latest gadgets at the expense of living within your means. You endorse the shameful and ‘secretive’ execution of people by a government that has one of the worst human rights records on the planet simply by ignoring how much of America is being consumed by the Demonic Dragon in the East. Those are not faked photographs, people, but the Chinese government’s reaction to them may very well be. If we can’t entrust them to provide us with quality products, how can we trust them with presenting the facts? Conversely, if we cannot entrust them with the due process of human dignity, how can we trust them with the national security of a foreign power – ours? So enjoy your portable CD players, your plasma televisions, your ‘do everything’ washers and dryers, and ham it up in front of the Jones’s. The credit that your soul borrows to pay for these earthly discounts will become due once we enter Heaven and that payment is fixed. Always! It is shamefully hard to avoid products that are made in China. The flag you flew on the 4th might well have been made by Chinese people who fear (rightfully) to be free. The Christmas lights you hang this winter might well have been made by Chinese Christians imprisoned for their faith. It is hard to avoid these products; they are everywhere. But won't you at least try? 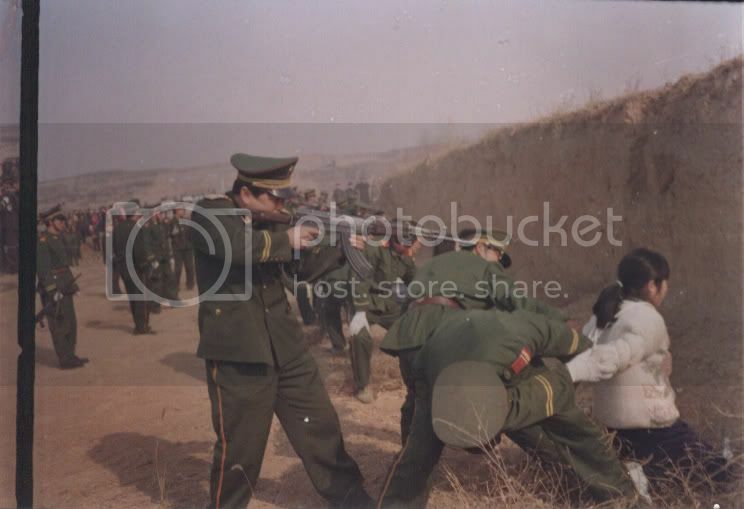 * Update: China's supremacy in executing its citizens is being challenged by Iran. But don't let this stop you from doing what you can to punish China economically. Oakland Editor War On Terror Victim?